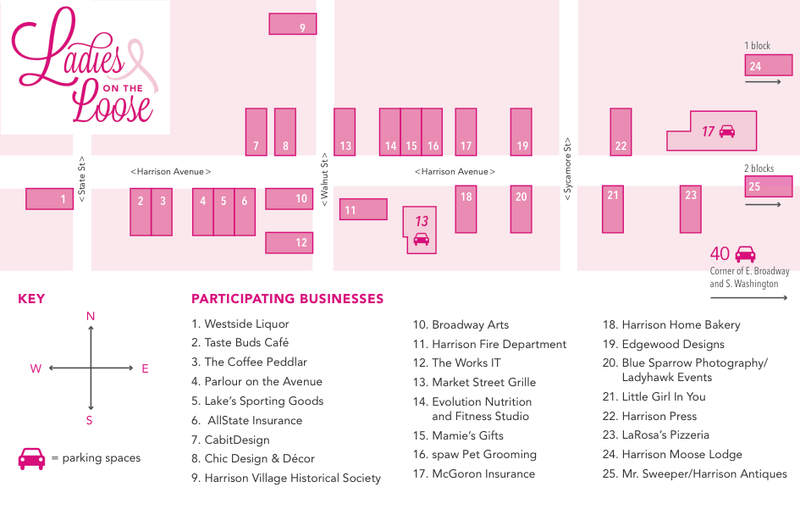 Every year since 2009, the businesses of Historic Downtown Harrison, Ohio gather together to not only organize, but also fund, a continuously growing event for breast cancer awareness. It’s a tried and true event that’s become a pillar of the community and a great fund-raising and awareness-building opportunity, but the marketing made you think you were back in the 90’s, there was no way-finding for an event that was based around getting around a town, and the logo…..well, there was no logo. We wanted Ladies on the Loose to be portrayed as the strong, meaningful entity that it is. So we were compelled to brand it. 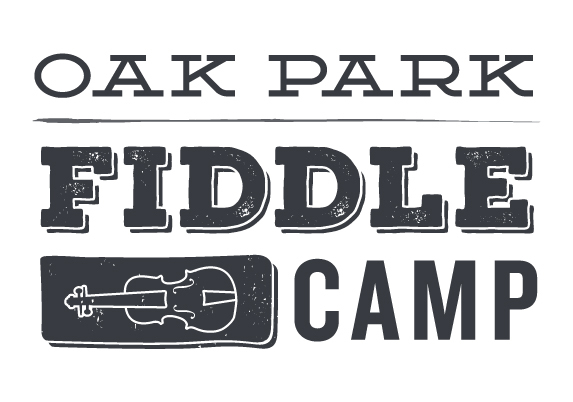 For the logo, we wanted to incorporate the breast cancer ribbon, so we chose a fun script typeface for its ribbon-like qualities and used the letterforms to draw a ribbon to complement the type. The end result captured the fun and spirit of the event while also lending it some feminine sophistication. For the poster, we used a shocking pink to really grab the viewer’s attention. 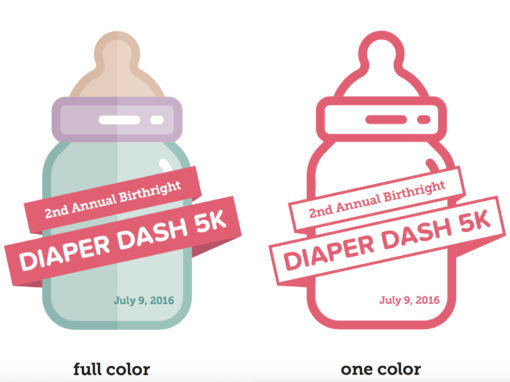 A mix of typefaces were used to communicate the details of the event in a playful, upbeat way. 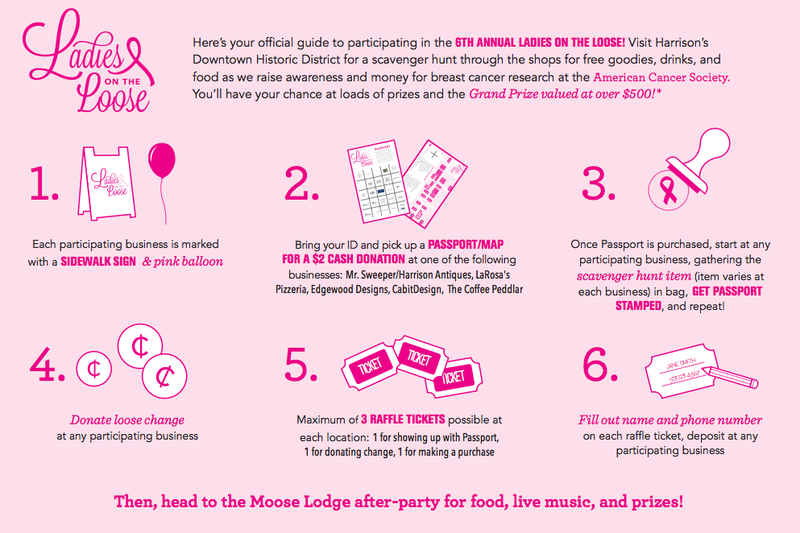 We wanted the infographic to keep with the fun spirit of the event while also being very easy to use, so we used clear illustrations to outline the steps of participating in the event. Overall, this was a really exciting project to work on, and we’re so glad we were able to contribute to this event for a great cause. With an all new map that we developed and designed to fit on the back of the Passport, attendees found everything they were looking for with ease. Explaining all the facets of the event had always proven to be a long-winded, fragmented task. Now, with an easy-to-follow, step-by-step infographic, that challenge is no more. 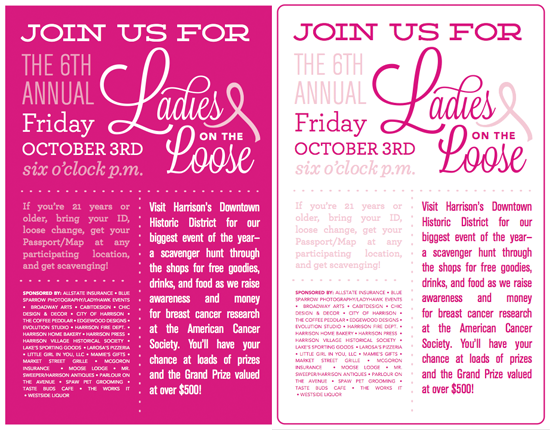 With the bright new logo and eye-catching posters, Ladies on the Loose was more ready than ever to advertise and market the event.